Summary: don't care where you buy $$$$ or more "fine" jewelry, get it independently verified before return option expires and keep every scrap of documentation. 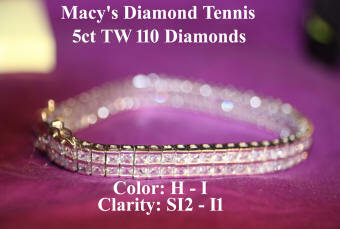 In 1993, bought diamond tennis bracelet from Macy's Department store. Paid $5000. Came with description and appraisal. Looks dazzling to the point that wife did not like to wear it as it brought too much attention. In 2017, sold on eBay and when buyer received it, she took to a local jeweler and it was a total fake! Do not know how fake got into Macy's fine jewelry merchandise offering but it did. TOLD BY MACY'S SALES PERSON: ALWAYS HAVE JEWELRY INDEPENDENTLY VERIFIED BEFORE RETURN PERIOD IS OVER!! What?? I thought a store like Macy's...I mean, they would not sell me a fake, right?? Reputation and all that!! If you did not know, all fine jewelry has 200- 500% markup, meaning you pay 2 times up to 5 times what item cost retailer to buy. Markup covers store cost, labor and of course, profit. Any appraisal you get from retailer is not worth the paper it is written on. It might say, "Worth $5000" but in actuality, item is worth 200 to 500% less. And I don't care about inflation and all that. If you going to buy fine jewelry, remember you are paying multiple times what item costs wholesale and absolutely, positively get it independently verified as to quality, weight, etc. before your return period is over. Oh, so you know, I did send fake tennis bracelet to Macy's New York City headquarters to their president of merchandising explaining problem. Did I get refund? Did I get a response?? NOPE AND NOPE.